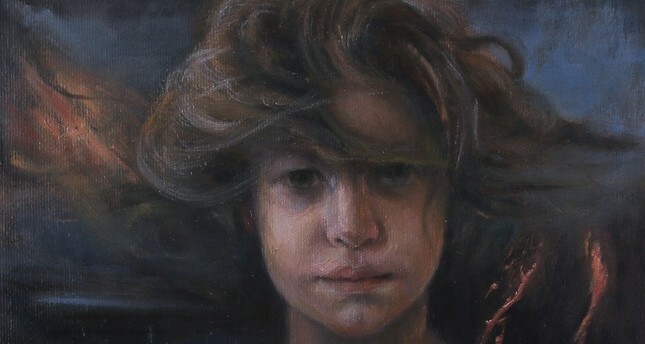 Doğuş (2019) by Feyzan Alasya, oil painting on canvas, 25 x 25 cm. Gallery Diani in Beyoğlu, Istanbul's core district, has been hosting "Biraz Cennet, Biraz Cehennem" ("A Bit of Heaven, A Bit of Hell") by Feyzan Alasya, who is one of the young and powerful representatives of the figurative paintings in recent years. Feyzan Alasya continues to create art with great joy, seeking to reach spiritual depths, in a manner befitting her personal essence. Fascinating atmospheres are imagined in the artist's self-originating adventure as she makes increasingly notable ventures in modern figurative Turkish painting. Adding conceptual meanings to her art with the different images she creates, Alasya forges a bond with surrealism while extending from there into magical realism with conscious and unconscious constructs. When asked about her art, Alasya says, "Is it about the mind or soul? What is it telling? By looking at my paintings, it is really hard for me to answer these questions which seem so simple. You see a painting and some figures on the canvas. These are the images hanging in a moment or space. Is it easy to give meaning to them? Why are they there? Believe me, I don't know either." Art critic Ruşen Eşref Yılmaz commented on the art and latest exhibition by the artist, saying, "In her compositions, she has created original arrangements with contrasting color relationships beyond traditional understandings. Mythical beings are rendered in painstaking detail with aesthetic concern, in the tones of mostly grey-blue and brown with stark brushstrokes. In transferring her dream world onto the canvas Feyzan Alasya seeks to create a humanistic world. She forms allegorical expressions with psychological content that tend towards a search for meaning. She questions the meaning of life and deepens its disquiet through the figurative beings she has internalized. Her painting is like the union of dreams and reality that exists in timeless worlds. Deciphering the unconscious like a magician, she externalized the 'things inside' and creates her own utopia. For example, her mythical beings in the latest exhibition, upon the shore of heaven and hell, engenders various tragedies, and creates their successors with their causes. Every single human-like being has its 'spirit.' The life forms they take can see with their eyes, speak with their mouths, grasp with their hands and express themselves with their gestures and mimics that they can sense and communicate between themselves and hypnotize the viewer which is, in my view, a profound triumph of the artist." The exhibition, which turns towards an understanding beyond logic and the mind, imposing spiritual truths and advancing beyond the reality of the external world, can be visited until May. 4.